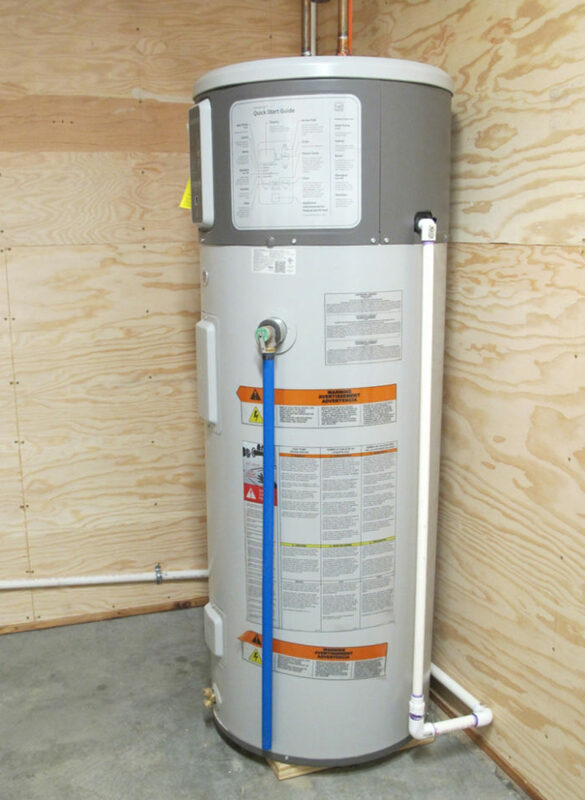 We chose to install an electric heat-pump water heater. 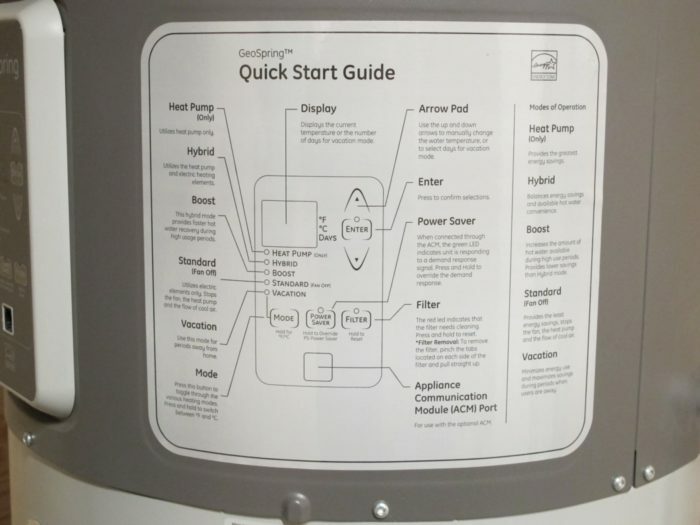 The 50-gallon GeoSpring water heater is manufactured by General Electric. Image Credit: Alex Wilson The GeoSpring offers several different control options: heat pump only, hybrid (both heat pump and electric resistance — less savings than heat pump only), boost (faster water heating and less savings than hybrid), standard (electric-resistance only — no energy savings), and vacation (maximum savings when homeowners are away). It's a little hard to read in this photo, but I love having the user instructions right on the water heater. As we build more energy-efficient houses, particularly when we go to extremes with insulation and air tightness, as with Passivhaus projects, water heating becomes a larger and larger share of overall energy consumption. In fact, with some of these ultra-efficient homes, annual energy use for water heating now exceeds that for space heating — even in cold climates. So, it makes increasing sense to focus a lot of attention on water heating. What are the options, and what makes the most sense when we’re trying to create a highly energy-efficient house? If we had built our new house three or four years ago, I suspect that solar water heating would have been included — or at least very seriously considered. But as costs of solar-electric (photovoltaic or PV) systems have dropped in recent years, more and more energy experts are recommending electric water heating, rather than solar thermal, and using PV modules to generate the electricity — so it’s still solar water heating, but not as direct. That’s what we have done at our new place. We realized in our planning that we had a great location for PV modules on our barn roof, but we didn’t have a good rooftop location for solar panels on the house. PV panels can be located farther away from where the energy is being used than can solar-thermal panels, because electrons can be easily moved fairly long distances through electrical cables, while piping runs for solar-thermal systems have to be much shorter. Also, PV systems also don’t have any moving parts to wear out or that require maintenance; freeze protection isn’t a concern; and pressure build-up from stagnation in full sun (if a pump fails or during a power outage) can’t occur. So PV systems are very attractive from a long-term durability standpoint. And if we’re generating our electricity from the sun why not use some of that electricity for water heating? That’s what we decided to do: install a PV system and heat our water with electricity. Conventional storage-type electric water heater. This is an insulated tank that holds 30 to 80 gallons, typically, and includes either one or two electric-resistance heating elements. Better storage water heaters have more insulation, so less stand-by heat loss occurs. Tankless water heater. A tankless, sometimes called on-demand or instantaneous, water heater heats the water as it is used. This offers the advantage of eliminating the stand-by loss that occurs with storage water heaters. Whole-house tankless water heaters are most commonly gas-fired, but electric models are also available. The problem with the latter is that they require a huge amounts of electricity. An electric tankless water heater large enough to supply a shower and another use at the same time will require a 60-amp or larger circuit at 220 volts. If a lot of homeowners were to switch to whole-house electric tankless water heaters, it would put a huge burden on the utility companies that have to meet peak demand — particularly in the morning when a lot of people are showering. 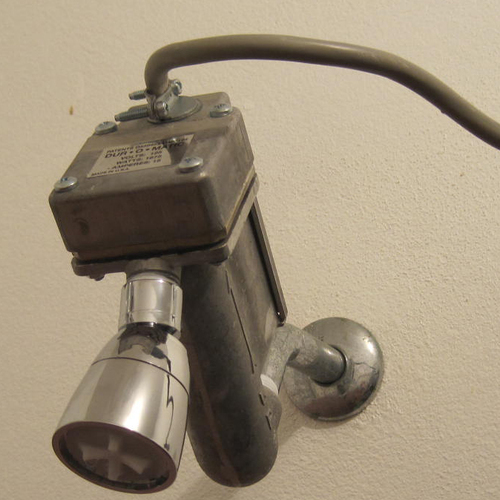 There are other issues with tankless water heaters that I’ve written about previously and won’t get into here. Heat-pump water heater. 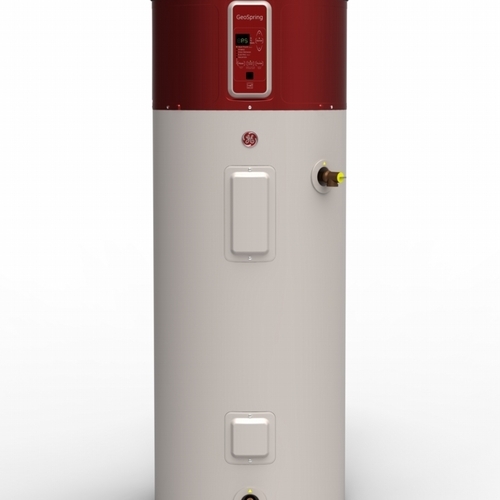 A heat-pump water heater extracts heat out of the air where the water heater is located (typically a basement) to heat the water. Because the electricity is used to move heat from one place to another instead of converting that electricity directly into heat (as with electric-resistance water heating), the energy yield per unit of electricity input is much greater. We measure that efficiency as the “coefficient of performance” or COP — a COP of 1.0 is, in essence, 100% efficient at converting electricity at your site into heat. Most heat-pump water heaters have COPs of 2 to 3, meaning that for every unit of energy consumed (as electricity), at least two units of energy (as heat) are generated. A heat-pump water heater is what we decided on for our house. We installed a 50-gallon GE GeoSpring model and, so far, we’re very happy with it. The GeoSpring is currently available only in a 50-gallon size, though rumors suggest that a larger 80-gallon model could be introduced. Because water heaters operating in heat pump mode take a long time to heat water, larger tanks typically make sense. If our two daughters were still in the house, a larger heat-pump water heater would have been more important. One of the factors that attracted us to the GeoSpring is that it’s now being made in the U.S. GE had made its first-generation GeoSpring in Mexico, but moved that production to the U.S. two years ago. The GeoSpring doesn’t have the highest performance of any heat-pump water heater on the market; Stiebel Eltron’s 80-gallon Accelera holds that distinction, but the GeoSpring costs a third as much as the German-made Stiebel Eltron. It’s also quieter. 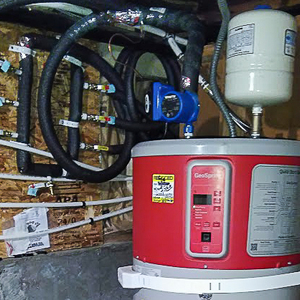 In next week’s blog, I’ll say a little more about heat-pump water heaters, including some issues with placement and implications of the fact that heat-pump water heaters cool off the space where they are located — depending on the season, that can be an advantage or disadvantage. Understanding heat-pump water heaters is important, as they will soon become the standard at least for larger electric water heaters — based on efficiency standards that take effect in mid-April 2015. 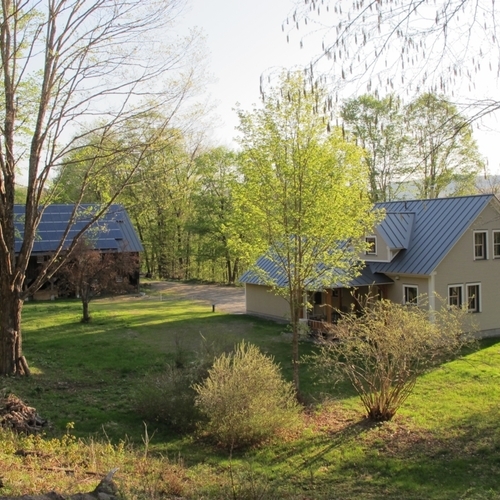 By the way, Eli Gould (the designer-builder of our home) and I will be leading a half-day workshop at the NESEA Building Energy Conference in Boston on Tuesday, March 4, 2014. 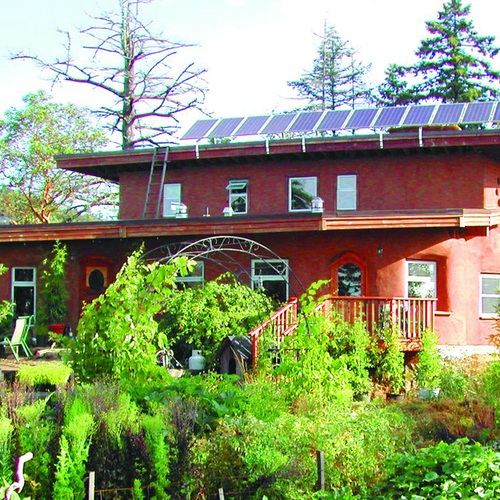 In this workshop, “What Would the Founder of Environmental Building News Do? Adventures on the Cutting Edge of Green Building,” we’ll be reviewing product and technology choices, describing lessons learned, presenting data on performance, and discussing, in a highly interactive format, some outcomes from this project that can be applied much more affordably in deep-energy retrofits. This should be informative and a lot of fun. I’ll also be presenting in the main conference, March 5-6, on “Metrics of Resilience.” Registration information can be found here. What is the square footage of the space within which you have installed the Geospring and what is the ambient temperature range of the space in winter? I would be interested in any comment you may have about the performance of the unit in the heat pump only mode or the hybrid mode.. I installed the Geospring last summer. Hot water usage is by my wife (approx. 2 people worth) and me (approx. 1/2 people worth). The unit is installed in a 210 s.f. utility room that is open to the rest of the house by a large open door. In the summer, I guess the unit worked fine in heat pump only mode, although it sure did run a lot. Now, in winter, the ambient temperature in the utility room ranges from about 67-68 in the day to about 63-65 at night. I tried to keep it running in heat pump only mode, but it just seemed to run on and on in that mode, even at 67-68F, ambient. So I pretty much put it in all-electric mode for the winter, since it also ran on and on (several hours at a time, just after a shower, for example) in the hybrid mode. I expected a little better performance at 67-68F ambient. Also, maybe comment or keep an eye out for refrigerant oil in the condensate output. An "experienced" plumber who goes on service calls for GE told me that the Geospring has had some history of that problem. After about 6 mos., I have not yet felt it from my unit; however, it hasn't been running in heat pump only mode or hybrid mode since about mid-December. 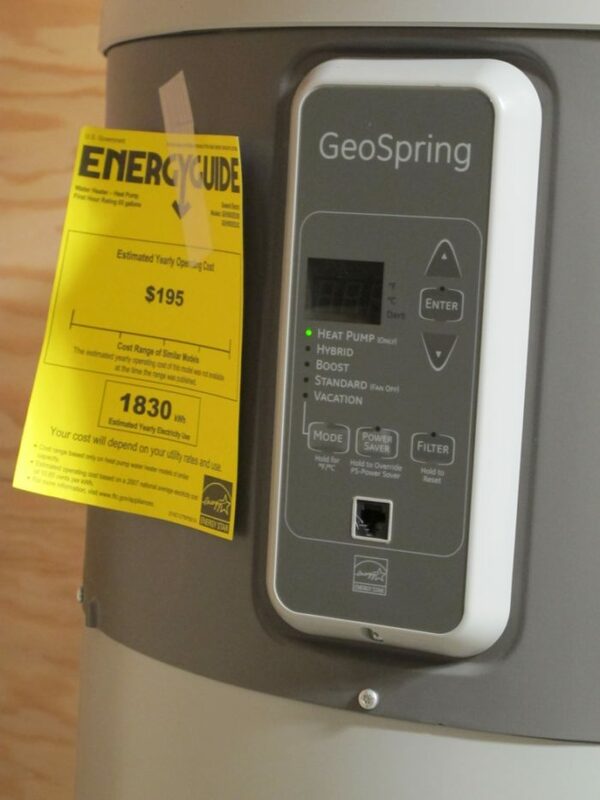 The big blue box store often has the GeoSpring priced at $999. For a short time it was even at $799. There are also 10% off coupons that aren't too hard to get. Oregon offers a $600 tax credit, and the US government offers $300. If you time your purchase right, you can get this water for free or even earn a small profit. You'll probably spend a few more bucks on installation, but regardless it's an incredibly good deal. My understanding of heat pumps (and thermodynamics in general) is that they become less efficient as the temperature gradient gets steeper, ie, it takes more energy to go from 100 to 101 than it did from 90 to 91. It seems like you could lower the set point of the heat pump water heater to say, 105 degrees, then boost it with on-demand point-of-use electrical heaters matched with the use of the water. You'd need a unit that can do a 20 degree boost for washing dishes, and a smaller one in the bathrooms if anyone in the house likes really hot showers. That's an intriguing suggestion. Your approach would reduce the amount of energy lost in the pipes as the hot water travels from the water heater to the faucet. Spending money for noise complexity increased government taxation. I can't see it in cold climates. Great idea in warm humid climates. They should be made to last forever though. Non steel tanks, high quality Asian compressors? Lastly water heating to me is a non issue. Building cost, heat, and land taxes are the costs foremost. We all spend more on almost everything other than heating water. I'd like to see more research into the Hybrid approach as well - it makes sense to me to have an efficient central unit doing most of the heating and then a small point of use/on-demand unit at the faucet to add a little bit of extra heat when needed. This seems like a good way to address the wait time for hot water issue that you would normally use a re-circulation pump for. David is correct that the COP of HPWHs drop throughout the heating cycle, with the highest COP occurring when the average tank temperature is lowest and the lowest COP occurring as the average tank temperature is highest. NREL did lab testing (http://tinyurl.com/lb4pwrk) of six different models (including the 1st-gen GE, predecessor to the one Alex writes about above) and mapped the COPs at various tank temperatures (see page 54). COP for these models ranged from about 2.0 to about 2.5 when average tank temperature approaches 120F. With a COP of about 1.0 for a tankless POU water heater, you'd have to have enormous distribution losses and tank losses in order for the lower COP of the POU boost strategy from 105F to 120F to make sense. Better idea would be to let the HPWH do all of the work and use an on-demand circulation pump in order to reduce distribution losses. I like the concept of just installing panels and then using a HP - but in many parts of the US/Canada isn't putting panels on to offset elec usage and/or generate $ via net metering a more economic (and likely Eco due to transmission/generation losses) to still use a cheaply heated nat gas water heater? I calculated that if you use a minisplit to heat the air in your house at a COP of 3.0, then a GeoSpring (COP of 2.5) to heat the water, the overall COP for the system is roughly 1.5. Still much better than straight resistance. 1. A minisplit for heating is usually cheaper than gas. 2. You really shouldn't cook food with gas because of IAQ issues. b. Excess PV electricity production isn't paid out at retail any more for many utilities, which means you can't really use PV to offset natural gas costs. 4. A low energy home would use very little gas, so the typical monthly service charge of $8-$25 becomes very significant. I suppose as always depends on your situation, location, rates, etc. In MN (or other z6+) vast populations in NG supplied areas - and pretty much every house (new or existing) need to heat there home with a good bit of heat. In CT I think you'd need a COP of 4 to equal the cost/BTU of natural gas. Electric prices here are high though... Unfortunately in our part of the state there is no natural gas so the HPWH should beat out oil and propane easily. You're right, of course, that using the heat pump to get all the way to 120 gets you the highest COP. But my suggestion was not intended to get the maximum efficiency, but rather to improve usability of the system. As Sonny noted above, the heat pump did not meet his expectations of performance and he ended up running in resistive-only mode for the winter. When HPWH become more common when the new efficiency regulaions kick in, I wouldn't be surprised if many homeowners just turn them to resistive-only mode to get the kind of performance they're used to, defeating the purpose. In addition, if the house was designed for a silent resistive water heater, and then the homeowner replaces it with a heat pump unit, they may not like the noise the pump makes when it kicks on and runs for many hours following a shower or load of laundry. I think a hybrid system makes more sense when viewed through that lens. Sonny didn't provide a lot of details about his situation...only that the HPWH ran "on and on". My own HPWH also runs on and on in the winter...this mostly has to do with very low incoming water main temperatures (as low as 42F) in the winter, compared to summer (as high as 82F). The fact that a HPWH "runs a lot" is only a major issue if the noise is bothersome, which I acknowledge is an issue. Upcoming split-system HPWH's will solve that problem (and have a much better EF! ), though at higher cost. I would argue that most of the time, average operating tank temperatures for any kind of water heater with a 120F setpoint are in the range of 90-120F. It's relatively rare to drain a tank of 75% of its heat...let alone 100%. The solution you're proposing would limit the heat pump usage to the relatively rare occasions where tank temperature drops below 100F. Instead, what all of the manufacturers (except Steibel Eltron) have done is to offer a "hybrid" setting where the heat pump is used most of them time, except for instances where tank temperatures drops below a certain limit, where the electric resistance heating elements pick up the slack. None of you are addressing whether these heat pump water heaters make sense. There is much more to this discussion then COP of 2. Question. Would someone post the 2015 code relevant? A heat-pump water heater heats water by robbing space heat from the room in which it is located. So you can't use a heat-pump water heater to heat a house. The more you run the water heater, the colder the room gets. Moreover, heat-pump water heaters have a low BTUH output. If you want to heat your house with a heat pump, abandon the PEX tubing and install one or two ductless minsplits. "...lower the set point of the heat pump water heater to say, 105 degrees..."
That temperature is right in the sweet-spot for high rates of legionella growth (85F-115F), and would likely increase the hazard by an order of magnitude. Setting it at 120F stops legionella growth but doesn't kill it. A storage temp of 140F will slowly kill established colonies over time, but carries an energy use penalty. Tempering the output of a higher temp tank to 110F or lower to reduce scald risk is arleady built into the IBC code, and reduces the distribution heat loss, but won't fix any COP issues related to a heat pump water heater. The legionella risk of 105-110F distribution water is low, since it does not stagnate at that temp, and is fully purged on almost every medium-sized draw. Legionella in hotel hot-tubs kept at 102-105F is well documented, and surprisingly high-risk, one of the main sources of identified clinical cases. Don't turn your showering water into a hotel hot tub! No matter how much is talked about HPWH units, they certainly make logical sense to use in a warm humid climate. Trying to make sense of using them where Alex Wilson lives is a stretch. And none of you mention $$$, and how poorly these things are made to date. Name me one unit that is made to last the several times longer than a standard Marathon tank for example. I say go Marathon plastic tank, heat it with PV, Done, Anything else is complex nonsense at this time. The units need major improvements and then still only make sense in climates where their cooling and dehumidification can be put to good use. That aspect I could use where I live but only for 3 months. but I still don't see why I would get one. I've always planned to keep it simple and get a plastic superinsulated 50-gal. Marathon. That's what I'm sticking with, unless someone on this thread can convince me otherwise. It appears the German made Stiebel Eltron is far better in both reliability and efficiency over the GE model. The unit is a good option for those living in areas that have no natural gas and want something more efficient than resistance element heating. On a different note. What is with some of the wet blanket comments by a frequent cynical blogger? The negativity and cynicism does not stop. Please lighten up or you will be known as the curmudgeon. I guess the glass is always half-empty. Back to the topic at hand. How loud are these units? If located in a mechanical room, would it have to be sound proofed? I am positive that a Marathon tank is a good tank. Peter, I here you and wish more blogs made sense to me so I could be positive, You all are very much misleading yourselves... when you think adding costs and complexity is doing something positive IMO. I believe that if I did not post there will be many unhappy owners of complex crap. Good for me to sell more and fix more but that doesn't change my opinion. Also besides a plastic Marathon there are SS tanks and if one changes out the anode rod on steel tanks then that may greatly help too in longevity. My positives... oh and I did mention a climate that HP water heaters make sense. 1) EF Champ is no longer Stiebel Eltron. That honor rests with the latest State / Smith / Reliance / Whirlpool / Sears 50 gallon model (same unit, different badging). EF = 2.75. I have one in the field so far and it is quieter than the GE, although side connections are less convenient in retrofit situations. I'm told it is made in Juarez. Client is pleased so far. 2) 1st gen GE (grey / blue with a narrowing between compressor and tank) was made in China, not Mexico. It has issues with evaporator leaks. I have experienced one evaporator leak with 2nd Gen Geospring made in Kentucky. 3) If there is ANY refrigerant oil found in condensate line, the unit IS or shortly will BE a storage electric resistance tank water heater with an EF around 0.90. 4) Stiebel model has a backup resistance element but it is small and energized sparingly. Stiebel also said to be difficult / impossible to adjust temperature - fixed at 140*F.
5) Smith State etc are discontinuing their 1st gen 60 gallon model since the new 50 has similar first hour rating. They continue with the big 80 model...beware noisier than most. 6) For the HPWH compressor to run a lot is perfectly OK, as long as users not exhausting tank entirely and experiencing discomfort. A nearly exhausted GE or Smith 50 might run continuously for 6 hours in northern climates. Nothing wrong with that if the unit is located where heat is available and the cooling of the surrounding air is not a problem. 7) Servicing HPWH is an interesting dilemma - most plumbers are ill-equipped / untrained to deal with the refrigerant side of an HPWH, and appliance repair techs are ill-equipped and unlicensed to disconnect / reconnect plumbing lines. In theory the HPWH can be serviced by appliance techs if labeled clearances are maintained, but that is often overlooked or prevented by site conditions. In a conditioned basement, it seems this is an energy loser in the cold north, in that any heat removed from the basement air to heat the water has to be made up by the furnace. Absolute sense in the warm south, where cooling outweighs heating, but not the north. The one way I could see this working in the north is if the air source is piped in from the outside, instead of using the basement air. Can that be done? But then, the delta T probably gets too big for the heat pump (it was still -15 here in Wisconsin earlier this week). Alex, If you still have some roof space available for PV, you could add a couple of extra panels and use that for solarThermal on the water tank..
One of the novel ideas that finally (after years) is making it to the market. Is a PV version of the Butler Solar H2O wand. (I guess they've made the same observation as others and the cost of fluid based solar H2O systems). Price is still high... I am curious whether it would buy anything used in combination with HPHW.. Hot water from a refrigerator or heat pump for homes? How about capturing heat from a refrigerator condenser into an undersink 5/10 gallon water heater with an electric backup? How about the heat from the heat pump air conditioner? If it's new construction, the floorplan would have the refrigerator and heat pump adjacent to to the water heater/utility room to capture the heater off the refrigerant. We actually positioned the mechanical room beneath our kitchen in part for this reason, and we installed a duct under the fridge. While we haven't done so yet, we are intending to add a small computer fan (or something like that) to dump heat from the refrigerator compressor into the mechanical room. I'd love to figure out a way to get the fan to turn on when the refrigerator turns on; any ideas? We also intend to passively dump some wastewater heat from our graywater into the mechanical room. We separated graywater and blackwater in the house so that we could use 2" PVC pipe for the graywater. The intent is to cut out a section of this 2" PVC that runs through the mechanical room and splice in a section of 2" copper fin-tube pipe. Then when hot water is going down the drain, some of that heat will be passively dumped into the mechanical room air. It's a similar idea as the GFX drainline heat exchangers, except that it's a water-to-air heat exchanger instead of a water-to-water heat exchanger, and it will work even when draining hot water isn't coincident with using hot water. That idea was posed in a comment to this blog a year or two ago, and I haven't forgotten it--but I haven't found 2" copper fin-tube yet. Any ideas as to whether that will be worth it? Alex, look for low cost "thermal snap disc switch". Little bimetal switches that you should be able to wire tie to the refrigerator condensor coil.. (if the coil is accessible). Snap switches do not have any phantom losses. The power supply for the muffin fan to move the air will have standby losses. Choose carefully. Put a small piece of black tape on the coil and use IR thermometer to see what the temperature rise is... set the snap switch so triggers on when above the expected room ambient. The problem I can see, is that the phantom losses from the power supply over the course of the year may exceed the benefit you gain. Unless of course the coil gets real hot during the winter time. I doubt that you need to heat to be moved downward during the summer time. A quick look on internet has lots of hits for the snap switches.. all for prices under $10. The use of ducting to move excess heat from one location of a home to the HPHW was a common theme that I saw at the 2013 Solar Declathon. 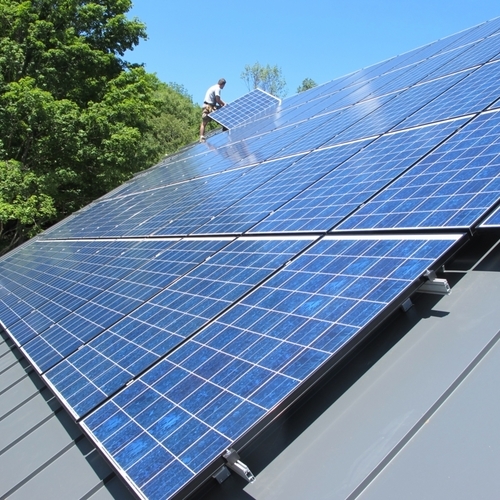 The Butler Solar idea won't save any energy for grid-connected homeowners with electric-resistance or heat-pump water heaters. All it is, is an electric resistance element that is directly wired to PV panels. Most homeowners already have an electric resistance element in their water heater -- it just isn't directly wired to any PV panels. Of course, if you have a 96% efficient inverter, you get a small efficiency boost from going DC-direct. But that advantage is overwhelmed by a big disadvantage -- this electric element continues to heat the water in your tank, even when the water is already up to temperature. The PV power used for this unnecessary exercise would be better sent to your electric meter, so that it can run the meter backwards and lower your electricity bill. If you are off-grid, you might want to fool around with the Butler electric-resistance element -- but most off-grid homeowners have better uses for PV power than water heating, and have other ways to heat water (in my case, solar thermal collectors in the summer and a coil in the wood stove during the winter). 1) COP of 2.0, thus requiring only half the energy needed as compared with direct resistance heating. 2) Using about 6 to 7 Kw-Hr per day for the two of us. 3) Effective moisture management as the unit goes on recharge after a quantity of hot water is used in the home to reclaim the energy for both the sensible and latent heat in the exhausted air stream. 5) Free cooling in the summer as the 42F discharge from the coil is dumped into the heating ductwork instead of to the outside. Martin, I do understand it that in many cases it would simply make more sense to build out the solarPV on top of the house, perhaps up to the maximum allowed. However, the point is that PV modules are now priced often below the cost of flat plate collectors, lower sometimes than the equivalent tube collectors and rack. The balance of system costs for the "solar" hot water heater - using an additional resistance heating element in the tank - may now be approaching or lower than using a fluid based solar hot water heater. The low voltage DC power for the new in tank heater should be easier to run than the fluid lines. No fear of freezing. You add a temperature mixing valve and run the tank temperature above 130, leaving the prior tank setting to 120. If the utility limited PV size to perhaps 10kW, adding 1kW of panels dedicated to the hot water heater only - would not violate an interconnection agreement. 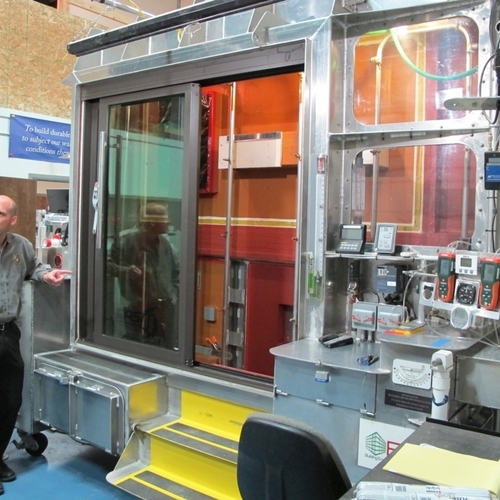 As the prices of the modules keep dropping, there will be more non-traditional applications for them that probably didn't make sense before, but they are likely to in the future. If you have a basement where you run a dehumidifier constantly, choosing a model that is good for that gives you free heat in the water heater, although you may be out of luck during some cold winter months unless you get a model with a defrost. I don't see the cooling being much of a benefit as the distribution would be complex to be effective. And as noted in a prior comment, the cost of maintaining gas and electric service is skyrocketing as providers seek to raise the fixed fees. Canceling gas service saved me $28x12months. I may have lost most of the savings during this brutal winter with my electric heat pump, but I like the feeling of not giving away money 8 months out of the year. There is also a safety factor in that gas is more difficult for a homeowner to work with and has expensive venting, etc to deal with. Stay away from A.O. Smith water heaters. I purchased a high efficiency Vertex in 2007, in Nov 2010 it broke flooding my finished basement causing thousand of dollars in damage. They replaced it with a new identical model. Now a little over 3 years later that one broke, luckily I had built a "dike" which fed the water out to the garage saving my basement from damage. But when I called they said the warranty had expired even though this unit was only about 3 years old. They said the warranty goes back to my original purchase regardless that it was a brand new unit only 3 years old. But how does a hot water heater break in 3 years time - they make junk product that's how. And they don't stand behind the product either. We had a 9.0 KW PV system installed in February. I've been planning to replace a very old, (25 year +/-) gas water heater for years, (darn thing just won't die and natural gas is reasonable here). While we haven't had a full year to see how our projected 90% +/- of our electricity needs covered pans out, the first few months are very promising. With excess production each month to date I naturally started thinking electric water heater. Our local electric utility does credit us for excess production through their "Net Zero" program but at a wholesale rate. Using all we produce for our own needs is certainly preferable. 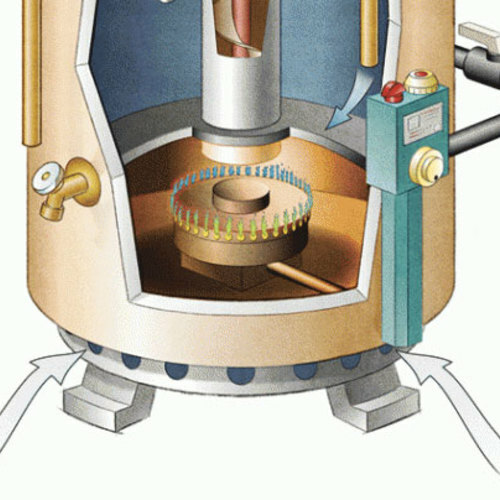 Reading about the pros and cons of the heat pump water heaters out there I have vacillated but I'm leaning toward going ahead with the GE unit, (though I am leery of the mechanical problems). Separate from that I think the excess electricity we produce will pretty much cover the needs of the HP. I'm also curious to see if the "natural", (no pump), hot water rising heat loop we have and love doesn't work well with the slower recovery of HP units. Finally I'm factoring the excess cold air coming off the HP in the winter into my overall energy use requirements. We have a 95% efficient gas furnace. Even if it requires marginally more gas use to offset that cold air it will be at a very efficient heat cost rate. Wondering whether Alex Wilson, now with much more experience with his HPWH, can give everyone an update on its longer-term performance? Hi Chuck, Yes, I do have some thoughts. 1. After 5 years, our GE Geospring HPWH continues to work fairly well, though there has been an error message on it for the last year or two, and since GE sold its appliance business and the company that bought most of that line dropped the Geospring, I haven't been able to get anyone to advise on what the problem might be. (I recently learned that F.W. Webb has picked up the product, and I haven't tried contacting them yet.) The other minor annoyance: a filter alert periodically goes off, and I have to press a reset button twice (longer the second time) to get it to turn off. 2. Were I to replace the Geospring today, I'd probably go with the Rheem product, though the Steibel Eltron is also a very good product. I might also consider the Sanden system (see below). 3. Having no waste heat source in our Vermont basement does mean that the temperature drops throughout the winter. I'm thinking of setting the water heater to electric-resistance mode next winter and seeing how much of a difference that makes. The basement temperature currently drops to the low-50s during the coldest weather. 4. If I had the Rheem HPWH, that product offers ducted exhaust and/or inlet, so I think I would be able to duct the cold air coming out of the HPWH to the outdoors in the winter. I would have to figure out what the impact of doing that would be on the pressure balance in the house; that could be a problem, because the outdoor air in the winter would be too cold to use for the HPWH. Because the chilled, dehumidified air is a good thing in the summer, I might also try to figure out an easy way to switch between different venting modes. I remain convinced that HPWHs make a lot of sense, just as air-source heat pumps for space heating make sense. As with the ASHPs, though, split HPWHs, like the Sanden product, offers some appeal. I look forward to seeing how the technology advances. I especially like the fact that the Sanden uses carbon dioxide as the refrigerant, rather than HFC, because HFCs are potent greenhouse gases. Thanks, Alex, for your full report. I think ducting the outgoing air outside would be counterproductive if the outside temperature is lower than the outgoing air temperature. That air has to get replaced, and one way or another that air will come from outside. >"...I think I would be able to duct the cold air coming out of the HPWH to the outdoors in the winter." Ducting it to the outdoors means an equal v0lume of outdoor air will be drawn into the house. Is the output of the HPWH actually colder than your average wintertime outdoor temperature? If not, that imposes an additional space heating load to the building that it would by simply cooling the basement, and almost certainly lower net (space + water heating) efficiency. If the cold output of the water heater were ducted to the indoor air intake to a modulating heat pump then net efficiency of the system(s) as a whole would rise during the heating season, giving the heat pump a more favorable delta-T to work with on the indoor air coil. This could create some odd interactions if it were a ducted mini-split sensing the indoor air temperature at the coil rather than at a wall thermostat type control.